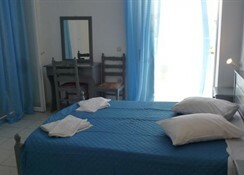 The Ikaros Hotel in Zante offers a close location to the nearest beach coupled with a range of on-site amenities that you can avail of during your stay here. The hotel offers a restaurant and bar as well as a swimming pool, free WiFi and an entertainment programme that will suit all ages. This family friendly property is also close by to the Tsilivi Water Park, Marathonisi (Turtle Island) and the History War Museum. There are several beach’s in the area with the closest being just a short walk away. The Ikaros Hotel in Zante is a great for couples, families and groups of friends who want a relaxing holiday under the Greek sun. 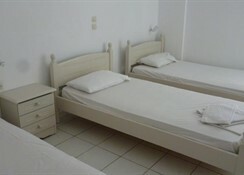 The Ikaros Hotel is located on the Greek island of Zante and is just 0.6 miles away from the Laganas beach. Other popular tourist sites include the History War Museum (0.6 miles), Tsilivi Water Park (9.4 miles) and you can also get to Turtle Island which is 7.4 miles away by boat from the Laganas beach. The Zante International Airport is 4.3 miles away. The hotel has 100 rooms in total spread across 3 buildings. You can book a Single Room, Double Room or Triple Room and there is also the option of staying on one of the three Apartments which can host up to five people. 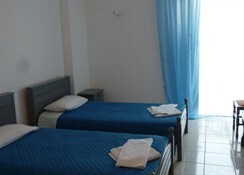 The rooms at the Ikaros Hotel have air conditioning and fridge (both incur a local charge) as well as a balcony. You can dine in the on-site restaurant with provides authentic Greek dishes as well as a range of international food. There is also a bar at the property which is open from the afternoon and there are numerous bars and restaurants within walking distance of the property. The hotel has a range of facilities including a swimming pool, separate children’s pool, ping pong and billiards tables in addition to sunbeds and an entertainment programme. There is free WiFi throughout the hotel and the Laganas beach is just a short stroll away being just 0.6 miles from the property. You can also take part in a variety of water sports at the beach or if you want to go slightly further afield for some fun then head to the Tsilivi Water Park. The centre of Laganas that has a wide range of bars and entertainment options is 0.3 miles from the hotel.